I have often wondered why they named it the Shard. Usually when I walk by it looks grey but as the sun set I appreciated its translucent quality, finally it lives up to its name! Irvine Sellar, the Shard's developer, acquired Southwark Towers, once occupied by PwC, as an investment in November 1998. Two years later he met with award-winning architect Renzo Piano. 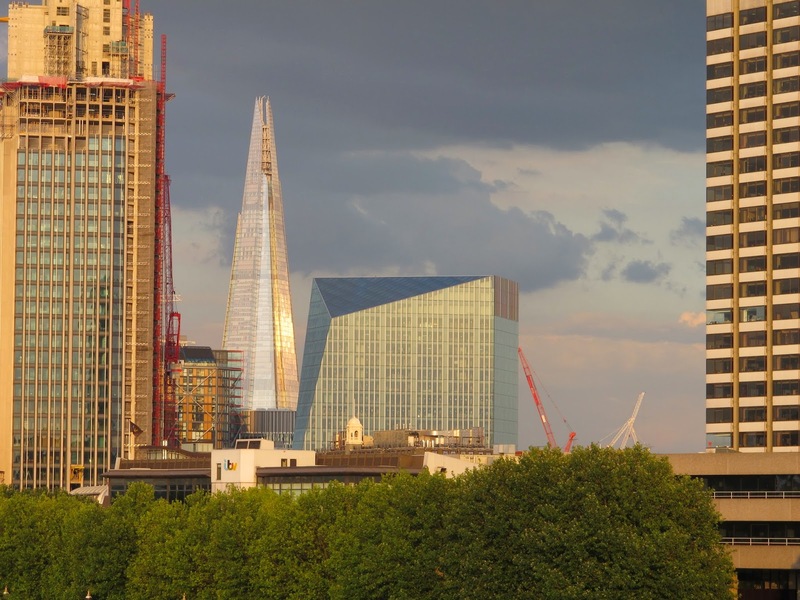 Taking inspiration from the spires of London churches and the masts of tall ships depicted by the 18th-century Venetian painter Canaletto, Piano designed The Shard as a spire-like sculpture emerging from the River Thames. Working right next to the Shard I felt part of the construction process. I am glad however that I didn't have to experience sub-zero temperatures, gale force winds and the Thames breaking through the protective dam. A million people visited The Shard’s viewing platform in its first year; I was up there on day 1. Six thousand people visit The Shard’s restaurants and bars each day and tens of thousands are expected to visit the Shangri-La hotel. But all in all, in London's setting sun it finally looks at home.